Are you ready to become a stunning Bride? As your personal Bridal Beauty Artist, you will receive nothing but the best talent, 20 years of beauty expertise, and five -star service. We do not outsource outside artists. All of our artists are in-house, who work with the Owner "Bridal Beauty Designer Lisa Lee". Lisa is the head makeup artist and hair stylist for brides, and Director for her artist who works with her on large groups. An elite team of the finest Wedding makeup artists and hair stylists in South Florida, Directed by Lisa Lee of Alluring Faces. 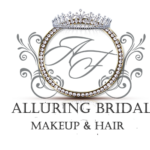 Alluring Bridal specializes in brides and bridal party Day of Makeup and Hair Styling. All of our stylists are in house not contracted which means the artist you speak to will be the artist on-site as your glam squad . Our passion is to bring your vision to life!